Lipsticks are became our day to day makeup essentials and especially few shades like Red, Pink and Coral are mostly used shades by women. 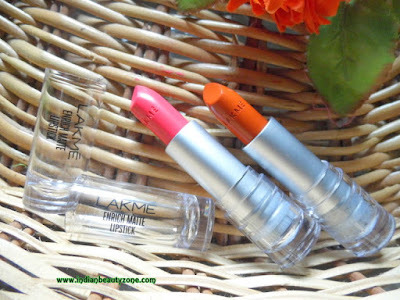 Lakme has affordable lipstick collections for daily makeup routine purpose. 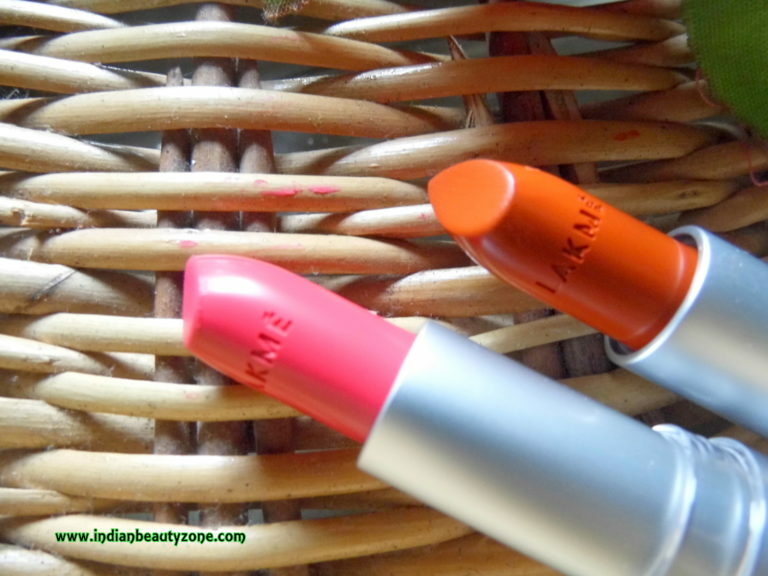 They have launched this Lakme Enrich Matte Lipsticks last year with lot of shade collections. I have received PM10 which is coral shade and the PM11 which is pink shade for review. 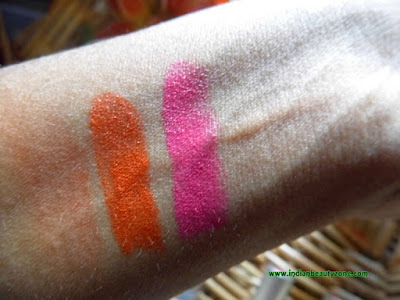 Let us see the review in detail, I have shared hand and lip swatches for your reference, my Skin tone is medium(wheatish). Lakme India Introduce Lakme Enrich Matte Lipsticks in 20 gorgeous and trendy shades. The lipsticks are specially designed for giving the vibrant colour to the lips and long lasting too, in additionally it gives long lasting shine and nourishment to your lips. The lipsticks are creamy yet gives you matte finish. Enjoy the creamiest texture with matte finish all through the day with your favorite Lakme Enrich Matte Lipstick shades. 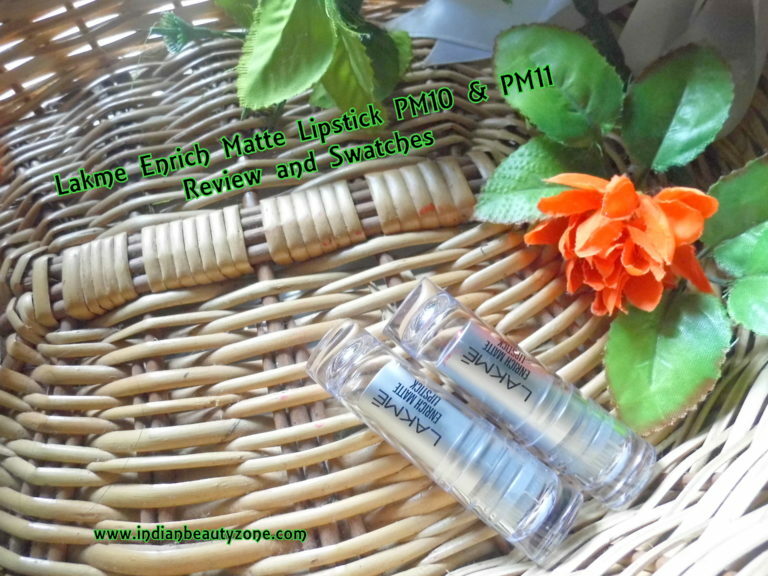 The Lakme Enrich Matte Lipstick comes in a silver colour packaging with transparent lid cover, at the bottom of the packaging the shades number mentioned for reference. It is user and travel friendly. Here PM10 and PM11 shades are reviewed, where PM10 stands for coral shade and the PM11 stands for pink shade. Such a beautiful shades but named by numbers... if I could stand a chance for naming these beautiful shades I would name as PM10 as wild red and PM11 as angel pink, both the shades are such a lovely and gorgeous shades which suits most of the Indian skin tones. The lipstick stays for more than 5 hours with light meals and drinks, even after that also you can see the shade's beautiful hint on your lips. It has smooth texture which glides easily on the lips. It hydrates the lips well. I found the lipstick bleeds slightly if you are applying carefully also it builds up dry patches if you have dry lips, so one should exfoliate the lips before applying the lipstick. They have awesome pigmentation. Overall it is a beautiful lipstick collection with awesome bright shades. PM 10 & PM 11 are beautiful shades. Dries out the lips after some time, so one need to apply lip balm before applying this lipstick. Lakme Enrich Matte Lipstick PM10 & PM11 are beautiful coral & pink shades. They have 20 shade collections to choose. They have awesome pigmentation and long stay power.